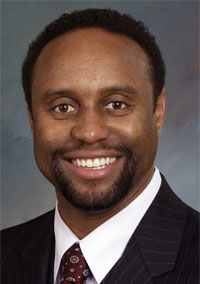 Emergency medicine physician Reginald Eadie was named president of Detroit Receiving Hospital, one of six hospitals that are part of Detroit Medical Center. Eadie, 41, is scheduled to begin the job July 26. He replaces Iris Taylor, 58, a registered nurse who held the position for the past five years and last month was appointed chief business officer for the system. Eadie joined Detroit Medical Center in 2008 as vice president of medical affairs for Harper University Hospital, which includes Hutzel Women’s Hospital.